Today, I ran at Patapsco again with the Vibram Five Fingers. I am definitely getting better at running with them. My feet are getting toughened up so stepping on sharp rocks doesn’t hurt (as much). I ran my normal hour loop in 56 minutes today. I am still way out of shape, as i had to walk up all the major hills, but I was able to totally bomb down the hills at speeds that I could never match in conventional shoes. OK, maybe I was a wuss previously, but I had good reason to be. I have had a few really gnarly ankle twists and sprains, so, at some point a few years ago, I decided to be really conservative in my downhill running. I would actually spend lots of energy slowing myself going downhill so I wouldn’t risk crashing. When I first started with the VFFS, I did the same, even moreso, since I was really cautious about stepping on a sharp rock. Now that I am more used to them, and have been working on my technique, I can run much faster downhill. I feel more stable, since I am lower to the ground, without a thick cushioned heel preventing me from feeling the ground. I am pretty psyched to run the Mt. Penn Mudfest coming up. 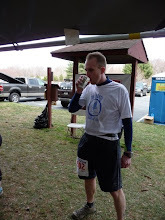 It’s a 15K trail run in Reading, PA, put on by Pretzel City Sports. If I can just improve my hill running/conditioning in the next few/couple weeks, I think I might actually be able to achieve a performance that I am happy with. In other news, I have definitely confirmed that the more types of shoes I wear, the more problems I have. Differing support, arches, heel widths, etc, all screw up my feet and ankles. I can wear the VFFs, and flip flops. Anything else hurts my feet. I need to order some minimalist work shoes ASAP. And my $3 flip flops are staring to fall apart with lots of use. Yesterday, I went to the pool, and it was such a beautiful day, and I felt so good, that I ran to the pool with the flip flops. Then I ran home. Then, I ran an extra mile around the neighborhood! I ran about 2 miles in the flip flops. I learned that you need to spend extra effort to keep the flip flops from falling off when running, which might be a problem when running longer distances. Also, my cheapo pair of flip flops started to chafe the skin on my feet, causing a raw spot. I put some tape over the raw spot so I could keep wearing the flip flops. Getting a good quality pair of flip flops is also a top priority.